Revel in a stay that is contemporary, but far from conventional when you visit Renaissance Philadelphia Airport Hotel. Boasting an unrivaled location 1-mile from Philadelphia International Airport, our hotel offers easy access to some of the area's most popular attractions including the Wells Fargo Center and Citizens Bank Park. Before setting out to sightsee or conduct business downtown, take a moment to relax and unwind in your spacious room or suite. Enjoy freshening up in our marble bathrooms, or finish some tasks using our work desks and high-speed Wi-Fi. Enjoy breakfast in bed thanks to our room service, or you can dine at one of our two on-site restaurants - The Sanctuary and Dorsey's. Both restaurants are terrific for gathering with friends or colleagues before attending an event in one of our 19 elegantly appointed meeting venues. 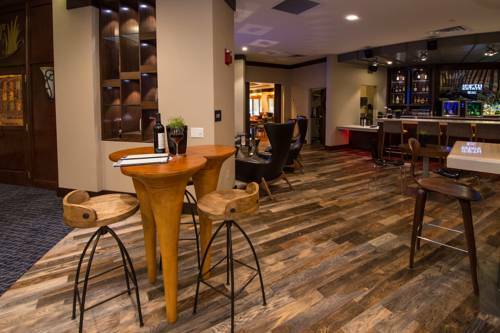 No matter what it is that brings you to the City of Brotherly Love, you'll appreciate every moment you spend at Renaissance Philadelphia Airport Hotel. The Sanctuary: The Sanctuary, our hotel's contemporary restaurant, offers a hot, cooked-to-order breakfast each morning. Dorsey's: Boasting a chic and modern design, Dorsey's offers a great place to unwind. Featuring American dining options including steaks, fresh seafood, pasta, healthy entrees or sandwiches, paired with a glass of wine, craft beer or expertly prepared cocktail.